Fall is pretty in the midwest. The leaves start to turn and sunlight moves through the trees differently. Coming home from work, I find lots of leaves on the patio and blowing around the driveway. The shorter days seem to trigger an archetypal rush to get ready for the cold season. I’m not sure how our ancient ancestors felt about preparing for winter, but a lot of us are thinking snow. Up north folks pretty much know they’re going to get a lot of snow. It’s going to stick around and accumulate. In the south they freak out with snow. Those people basically either stay home during an storm or go out and crash their cars in the stuff. Here where I live we’ve gotten used to waking up to just about anything between now and April. Ice is a no brainer. With a ten thousand pound work truck I stay home. No way am I going to risk sliding that thing off the road or into another vehicle. Snow on the other hand is a blast. I’d like eight inches of fresh snow every Friday night from the day after Halloween to April Fools Day. I wish for this because I love the look of snow, and, I want the convenience of not loosing work time to it. For the last four or five years we’ve gotten more snow than in the past. Big, heavy loads that pull down trees and clog the roads. About four years ago I was shoveling snow with two broken ribs and my sons helping. Between the ribs and the kids jacking around I decided to buy a snow blower. Funny what compels a purchase. These twelve to fourteen inch snows on our hundred and twenty-five foot driveway were more than I cared to shovel. Buying a snowblower was the best decision I’ve made in a long time. Snowblowers come in all shapes and sizes. Like haircuts and beer, you get what you pay for. The lightest of the blowers are electric, not much bigger than an upright vacuum. They work great up to about four inches of fluffy, cold snow. If you’ve got a sidewalk or teeny tiny driveway and plenty of energy this may be fine. Beyond that you could consider a bigger machine. The next level and most popular are gas powered “paddle” snow blowers, also known as single stage. They may use straight gas or two cycle oil/gas mix. They have two rubber paddles horizontally across the front that basically scrape the driveway surface as they spin and throw the snow up and through the chute. The chute can be turned to the left and right to deliver the snow exactly where you want it. They are normally not self propelled and have to be pushed like a lawn mower. They work pretty good. They will handle up to about eight inches of snow, depending on how wet the snow is. In our region snow might be pretty dry and fluffy at first, but we get a little warm in the mid-day and the snow starts to get real heavy at the bottom near the driveway surface. A paddle type snowblower starts to work pretty hard at this point. These machines are fairly light and can be rolled into the back of a station wagon or SUV to take to mom’s house for her driveway. They are available with 110 volt electric starters which are really handy when the machine is cold. Like their size the price on these machines is mid-range. Here in our area these machines are the most popular and are seen all over the place after a big snow. Then there’s the two stage machines. These machines have an auger in the front that breaks the snow up and delivers it to a second impeller that throws the snow out the chute. Be careful with this machine. Reaching in to clear a clogged chute could deliver a thumb or finger into the yard, still in your glove. This is the type I own. These machines are heavier, self propelled and will crawl through just about anything. They will handle really deep snow, and, when operated in low gear will grind through the big pile of snow and ice left at the end of the driveway by the snow plows. These machines are fairly heavy, take up considerable space in the shed and need a pick-up or trailer to be transported. Again, like their size, the price is the most. 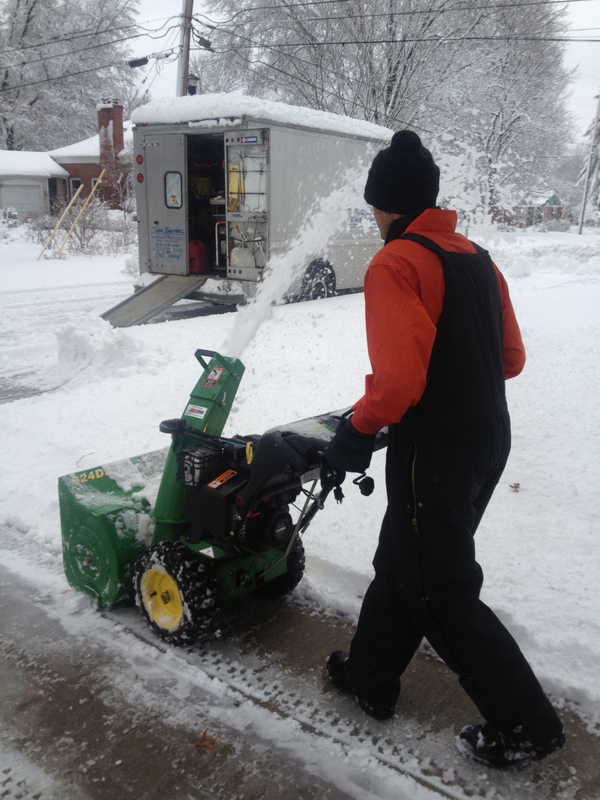 A lot of snowblowers come with options making the job easier and more comfortable. Electric and battery operated starters make getting a cold machine running a mere push of a button. Once warmed up they start easily with the pull cord if needed. They are available with headlights which seems silly until you try to clear the driveway early before going to work or after work when it is dark again. Some even have heated hand grips. Larger two stage machines can be fitted with a sort of plastic see through cab. I clear the driveway before I go to work. Once a car is driven on snow it’s harder to manage and may stick too hard for the machine to scrape it clean. At six am the headlight comes in handy. Another advantage of a snowblower is it throws the snow clear of the area. This is advantageous over a lawn tractor with a plow which at it’s best moves the snow to the edge of the driveway. If you are going to buy a snowblower this year, do it this weekend! The first heavy snow will clear the retail outlets of all machines available in a matter of hours. Do some research on line. Choose the machine you think suits you best. Buy your machine from a locally owned equipment dealer who can service the machine. Cheap machines from big box stores can be hard to buy parts for and sometimes impossible to service. This will be a considerable investment and you will likely own the machine for years to come. When the first big snow hits our area, you’ll be amazed at the ease snow is moved by a good snowblower. I have to admit, it’s one of my favorite things to do in the winter. You’ll still need a shovel to touch up the tight areas and stairs, but the time and back-ache you save with a snowblower will be great reward for your investment. Have fun, be safe and pray for snow, Friday night will be here soon.